This event held on the last Sunday of the month and includes food, drink, art and design, plus performances by local musicians and djs. Whether you fancy yourself as a bit of a foodie and you're wanting some proper good nosh or if you're looking for some of Manchester finest artists, iconic photographers and vintage traders... Look no further than West Didsbury Makers Market. The 80 odd stalls who will be showcasing have been carefully selected from North West Artisan producers to show the very best of local food, drink, vintage, art and modern craft that our region has to offer. From vintage stalls to inspiring Manchester artists to award winning pies. The street food arena promises to have visitors in food heaven with some bad boy burgers, sour dough pizzas, vegan and veggie cuisine and epic sweet and savoury crepes. Want to sample something across the pond? 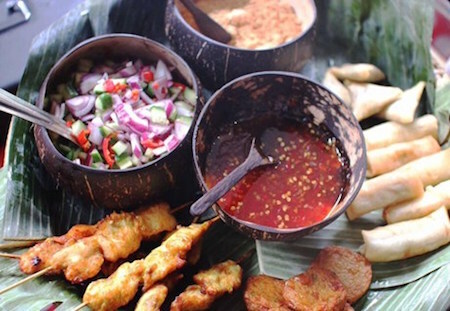 Thanya and Steve from Somtam Street known as the King and Queen of Thai street cuisine will have guests sampling proper authentic street food originating from family recipes from a combination of imported Asian ingredients and fresh locally farmed produce.